Steamfast steam cleaner reviews on this page include canister and handheld models. There are a variety of steamfast steamer products on the market today which presents a good range to pick from for individuals who prefer Steamfast as a manufacturer. In terms of preference and ratings, Steamfast is a reputable and highly regarded steam cleaner brand. It is well established in North America and has a significant number of users all across the United States. Amongst the popular models is the canister SF275 model and the handheld SF225 model which are both reviewed below. As we always say on this site, when considering what steamer to purchase first put the purpose of your purchase ahead of the price to avoid disappointment. In our observation a steamer that has very high wattage is likely to give you less problems spitting out water together with steam, a problem that annoys millions of steamer users. This is because water will not have been adequately heated up. A 1700 watt steamer, for example, actually produces extremely hot vapor and is more effective. These tend to be pricey however. Examples include the Ladybug series. Overall ratings of the steamer are very high with average four out of five stars on Amazon, for example. This steamfast steam cleaner model SF-275 like so many other steam cleaners today is an environmentally friendly non-chemical cleaner. 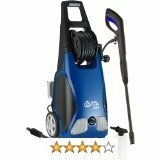 It is amongst some of the hottest canister design steam cleaners with a wattage of 1500w. As explained on other review pages on this site it matters what wattage your steam has. This model looks similar in design to one from the McCulloch steam cleaner series. Functionally wise the two are roughly the same and you may as well pick the Mcculloch if that's your favorite manufacturer. High wattage often times has a direct link to its effectiveness. A higher wattage steamer produces very hot steam which can do more in your cleaning projects. One of the hottest steamers on the market today are the Ladybug steam cleaners. These have a wattage of up to 1700w and produce vapor instead of moisture laden steam. 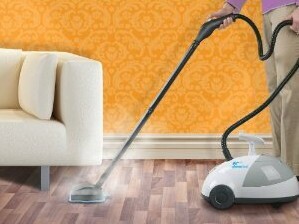 The steamfast SF 275 due to its high wattage can be counted on to remove tough grease, grime, kill dust mites and bedbugs amongst other things. This also includes germs. The SF 275 is shipped with a beautiful selection of accessories which will become handy in a variety of your cleaning projects. This steamer, however, reveals its low end mass consumer approach because it has to be let to cool before a refill. 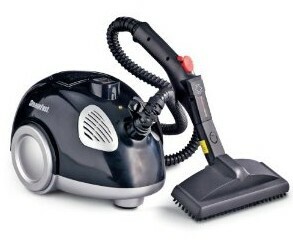 Expect to pay between $55.00 and $95.00 for this steam cleaner. Did You Know that canister steamer models loose important steam heat as it travels through a long hose. To get the hottest steam out which is effective in your cleaning, attach a short attachment to steamer. This is the advantage of up-right steam cleaners over canister models. The SF-226 is a handheld steam cleaner. It need to be mentioned from the onset that in order not to be disappointed with the cleaning capacity of handheld steamers it is important to appreciate their overall purpose. Just as other handhelds such as those by Haan, Bissell, Dirt Devil, Monster and many others these models are designed for light home cleaning. They generally essentially help you with maintenance work of an already deep cleaned environment. This means you should not expect your handheld steamer to clean effectively and efficiently your entire very dirt environment. They cannot do home deep cleaning. This will best be the work of canister or up-right steam cleaners such as ladybug steamers, Vapamore steamers and such others. Your tea-pot design steamfast steam cleaner will only give you up to 10 minutes maximum steaming without stoppage out of maximum tank capacity of 6 ounces. For each refill there is a cool down waiting time before waiting another 3 minutes for the steamer to fully heat up enough to produce steam. Never attempt to refill a hot steamer. This can cause a dangerous cloud of steam to rise towards you face or hands on contact of cold water with a hot boiler. 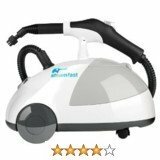 This steamfast steam cleaner SF-226 comes with an assortment of attachment that you can apply to a variety of your cleaning jobs. It uses no chemicals. All cleaning is steam based which is good for the environment. Some careful users have claimed owning the steamer in perfect working condition for as long as for years, a long stretch for a product priced at less than $40.00. We recommend this model for your small home cleaning projects. It may however last this long. This is expected for its price. This steamer from steamfast is distinctly different from other steamfast models. It is a canister slick design model with a front swivel wheel for easy maneuvering. 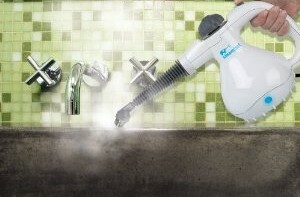 This steam cleaner also comes with a variety of attachments that will work on different surfaces of your cleaning jobs. The steam also cleans with water only and no chemicals are necessary. It has received some positive ratings from some users who appreciate its effectiveness dealing with ingrained dirt some of it in crevices. It also does your cabinets, your hard floor, rags and carpets. Other uses recommended by the manufacturer includes cleaning vehicles, upholstery, hardwood steam cleaning, BBQ grills, furniture, kitchen appliances, counters and cabinets amongst other things. This steam cleaner is however relatively limited in terms of how much time it gives you on your cleaning. Expect to get up to 15 minutes of continuous steaming before a refill is required. Some users have given examples of a refill being required to finish kitchen cleaning projects. This equates to two tanks full of water. You will also need to pause for a while to let the steamer cool down before refilling. This is not a continuous fill steamer.